(Newser) – "Finding out there’s no Zodiac would be like finding out there's no Santa Claus," writes Bill Black for MEL Magazine—which may explain why a whole bunch of people are no fan of Thomas Henry Horan. He's a semi-retired community college writing professor in St. Louis. He also previously worked as a detective and has read the entirety of the 2,500-page case file on the Zodiac killer as compiled by four California police departments—something only a handful of people have done. 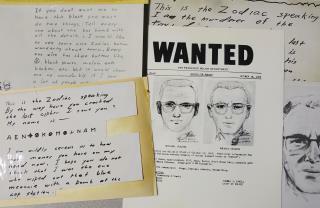 His conclusion: the five murders attributed to the Zodiac killer were committed by various people, and the letters were a hoax likely carried out by someone with access to the police reports. Black begins by detailing the five "canonical" murders, which took place between December 1968 and October 1969. One of the main reasons they never caught anybody is because the vantage point of the surviving witnesses was always from a lying down position looking up at the Zodiac, no witness to the crimes was ever standing, (back seats of cars and a picnic blanket on the ground), this yielded physical descriptions skewed to make the killer seem larger than he was. The whole time during the investigation authorities were looking for a much bigger man than the killer actually was. This made a potential apprehension much more difficult when the eye-witnesses were wrong on such a fundamental part of the description. After the final murder, which was witnessed from a second story window (again a bad vantage point to estimate physical size), the perp took a bloody swatch of the victim’s shirt to use as future proof of authenticity like Jack the Ripper did with Catherine Eddowes' kidney. The fleeing murderer was passed on the street by two policemen on foot but the description given from the police radio dispatcher had them looking for a black man. A verified letter with a piece of the bloody swatch removed from the final victim admitted that the two cops walked right past him as he vacated the area. Those two policemen who walked face to face right past the Zodiac said he was not tall at all maybe 5’8” or so. Sure. So out of all the various detectives, departments and agencies that have investigated this for decades, this one guy knows more.